London, UK. 08.07.2014. Andris Liepa returns to the London Coliseum with his programme of "Saisons Russes de XXIe Siecle" from July 8th to 19th. The programme includes the London premiere of Rimsky-Korsakov's LE COQ D'OR, or THE GOLDEN COCKEREL. 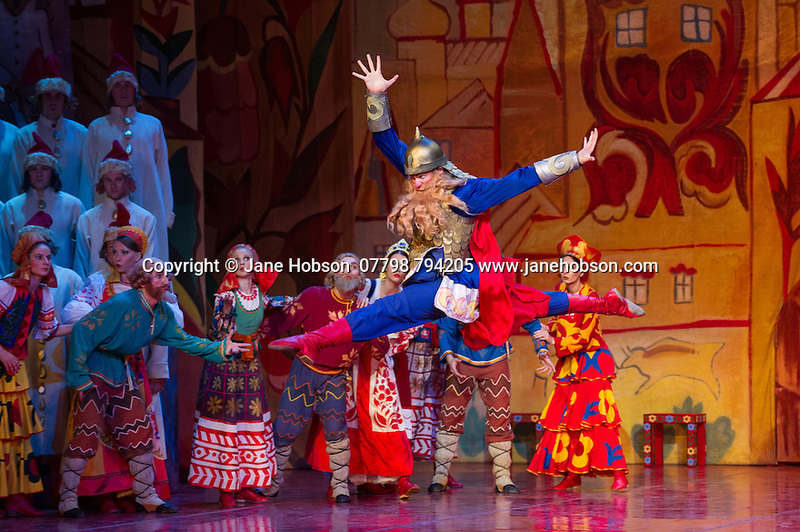 Dancers are: Pavel Okuev (Golden Cockerel), Oleg Fomin (Dodon), Natalia Savelieva Polkan (Queen of Shamakha), Yulia Selivanova (Amelfa), Ekaterina Blaschik (Guidon), Ekaterina Zaytseva (Afron), Maksim Podshivaylenko (Astrologer). Photograph © Jane Hobson.